Interest in the ways of the early church has never been more intense. What did early Christians believe about the divinity of Christ? What were the beliefs of those who sat at the feet of Jesus' disciples? Now, for the first time, a unique dictionary has been developed to allow easy access to the ancient material and furnish ready answers to these questions and others like them. 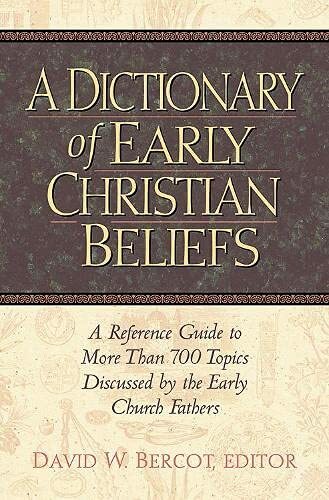 David W. Bercot has painstakingly combed the writings of these early church leaders and categorized the heart of their thinking into more than 700 theological, moral, and historical topics to create A Dictionary of Early Christian Beliefs. Wonderfully suited for devotional or thematic study as well as sermon illustration, this resource offers a window into the world of the early church and affords a special opportunity to examine topically the thoughts of students of the original apostles, as well as other great lights in the life of the early church. - Collects relevant comments on key Christian concepts from prominent figures such as Origen, Clement of Alexandria, Clement of Rome, and Hippolytus. - Includes key biblical verses associated with a given topic. - Offers brief definitions of unfamiliar terms or concepts, allowing easy access to the ancient material. - Provides a "Who's Who" of ante-Nicene Christianity to put in context the ancient Christian writers. - Discusses more than 700 key theological, moral, and historical topics. - Gives strategic cross-reverences to related topics. - Functions as a topical index to the writings of the Ante-Nicene Fathers. David W. Bercot, an Anglican priest and an attorney, graduated from Stephen F. Austin State University and Baylor University School of Law. He is the author of Will the Real Heretics Please Stand Up and is a member of the North American Patristics Society. "At times sermons and books refer to the beliefs and writings of early Christian leaders, and this dictionary is a compilation of those, arranged according to more than seven hundred topics. What did Clement of Alexandria say about abortion? What did Irenaeus note concerning the priesthood of the believer? How did Justin Martyr view the matter of divorce? Needless to say, the book is very interesting. "The book begins with a 'Who's Who' listing of the ante-Nicene Fathers whose comments are included throughout this reference tool. The section lists not only their names but also what they are remembered for, when they lived, and how to pronounce their names. 'How to Use This Dictionary' at the beginning is useful too. . . . it is good to have a handy resource on what [the church fathers] believed and said." --"Baptist Bulletin"
""A Dictionary of Early Christian Beliefs " is the best overall introduction to the ante-Nicene fathers in print, and is perfect for group study! The ultimate Sunday school reference work.